75kvdc cable for X-ray is an important part of X-ray machines, which can be divided into industrial X-ray machines and medical X-ray machines.Industrial X-ray machines can be divided into hard and soft X-ray machines according to the intensity of the resulting rays.The diffraction analyzer used for physical and chemical examination is attributed to soft rays, while the one used for larger area and thickness data is hard rays. X-ray machines generally consist of X ray tube, high voltage generator, control equipment, cooler, mechanical equipment and 75kvdc cable for X-ray. The high-voltage cable is connected to the high-voltage generator and the X-ray tube, and the high-voltage generated by the high-voltage generator is transferred to the X-ray tube to ensure the normal operation of the X-ray machine. X ray tube filament heating circuit is transmitted through high voltage cable. The circuit supplying X ray tube filament heating power is divided into primary circuit and secondary circuit. The basic requirements are stable and adjustable. 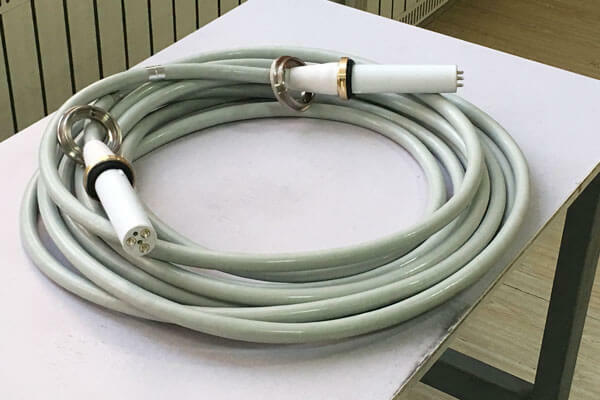 The length of Newheek 75kvdc cable for X-ray can be customized according to the customer’s needs, or the connection head of 75kvdc cable for X-ray can be selected according to the customer’s needs. The connection head of 75kvdc cable for X-ray can be divided into straight and curved ends, which can meet the needs of different customers.